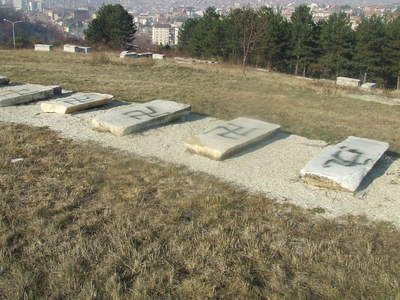 Desecrated gravestones at the Jewish Cemetery, Prishtina, Kosova, 2011. The Center for Islamic Pluralism, with members, supporters, and correspondents in Albania, Kosova, and the other territories in which Albanians form large communities (in Macedonia, Montenegro, and Serbia), as well as the Albanian diaspora in Western Europe and North America, joins the civic leaders of Kosova and of the Albanian-American community in denouncing the vandalism committed against the Jewish Cemetery in Prishtina, the Kosova capital. The Prishtina Jewish Cemetery has benefited from rehabilitation efforts by Spanish units of the Kosovo Forces (KFOR), honoring the Sephardic origin of Jews buried there, as well as American and Kosovar students affiliated with Dartmouth College in the U.S. and the American University in Kosovo. The Cemetery is located in the TaukBahçe neighborhood of Prishtina and had been neglected for many years. Apparently during the night of November 29, unknown persons entered the Cemetery and painted German Nazi symbols and other insulting graffiti on the gravestones. A photograph of the damage is included here. Such an attack is harmful to the common history of the Balkan people in the region, where Sephardim played a notable role in many areas of life. It also dishonors the Albanians who, as has been recognized by the Holocaust memorial authorities at Yad Vashem in Israel, acted courageously and consistently to protect local Jews and fugitive Jews from elsewhere in Europe from Nazi deportation. Finally, it stains the reputation of Kosova as a newly-independent republic seeking recognition throughout the world. While Kosovar authorities have not as yet identified the perpetrators in the case, Serbian provocateurs active in violent incidents in the northern Kosova region, as well as fundamentalist Islamist Wahhabi agitators who have recently interfered in the public and religious affairs of the republic, are among the most obvious suspects. In the first case, the United Nations Mission in Kosovo (UNMIK) and European Union Rule of Law Mission in Kosovo (EULEX) bear some responsibility for the revival of Serbian violence, by their refusal to dismantle Serbian "parallel structures" that, although strongest and operating most openly in northern Kosovo, are present throughout the territory of the republic. In the second case, leaders of the Islamic Community of Kosova (BIK) have enabled Wahhabi fanatics to deluge Kosova with propaganda aimed at division between Muslims, Catholics, and other Albanians. Both the so-called "international community" as represented by UNMIK and EULEX and the "Islamic establishment" embodied in BIK have failed to protect civility in Kosova. Kosova Republic president Atifete Jahjaga strongly condemned the vandalism at the Jewish Cemetery in Prishtina, declaring it an act inconsistent with the history of the Albanians as protectors, in the worst historical period, of Jews. Jahjaga called on the security agencies of the republic to capture the vandals and bring them to justice. Her censure of the destructive acts was repeated by Hashim Thaçi, Kosovar prime minister. Ruben Avxhiu, editor-in-chief of the Albanian-American newspaper Illyria, who has worked closely with CIP, noted that the graffiti could have been no more than a juvenile prank. But he continued, "The Serbs have committed and continue to commit enough real sins in the Balkans and particularly in Kosova. There is no need to blame them for imaginary sins as well. Leaving the Serbs out of this is not lack of patriotism. It is in fact, a sign of growth and readiness to take responsibility for our own actions and for what happens in our territory. It is something that comes with having your own independent country. This did not take place in northern Kosova, but in the capital, and Prishtina must make a point of investigating and condemning the act while working to make sure that it is not repeated, not only against Jews, but that it is not repeated against anyone: Albanian, Serbian, of any religion or ethnicity. Leave the dead alone."